this dish is very simple to throw together, but tastes like it took all day. 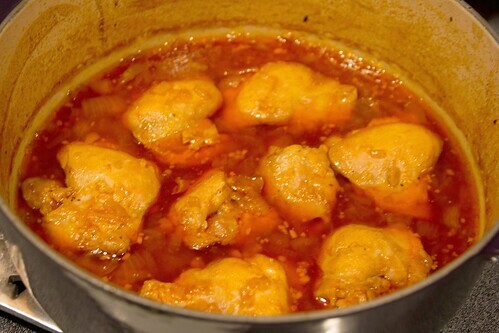 it is another dish that i have made a few times before blogging about it. 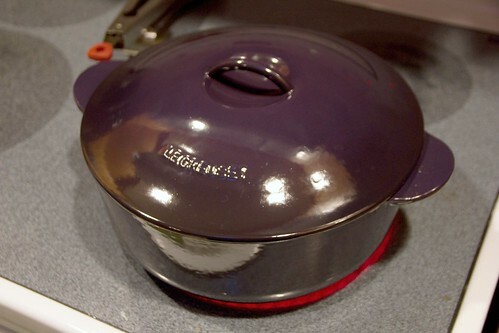 the most recent time, i used my new favorite kitchen “thing”… my dutch oven. swoon! i was always anti dutch oven. oh, they’re so expensive… oh, i can do the same thing in a crock pot… oh, i can do the same thing in a pyrex dish with foil over the top. i’m here to say that i’m a believer in the dutch oven now and am trying to find as many dishes to make in it as possible. thanks, hubby for the awesome christmas gift! heat oil and butter in a dutch oven over medium-high heat. 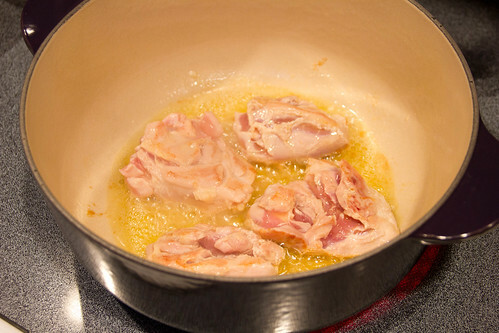 place chicken thighs, three at a time, in the pot, skin side down. brown both sides, the move to a plate until all chicken is browned. 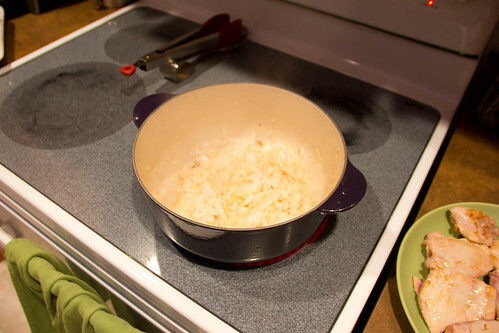 add onions to the pan and stir, cooking for 2 mins, until translucent and slightly brown. 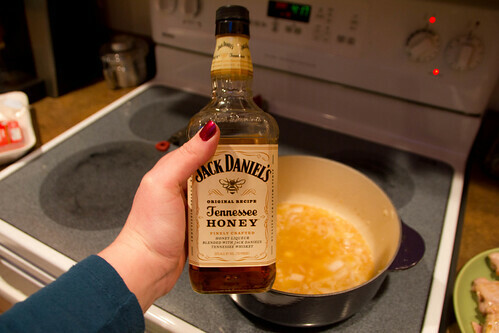 stir the mixture, making sure to scrape all of the good stuff off the bottom. 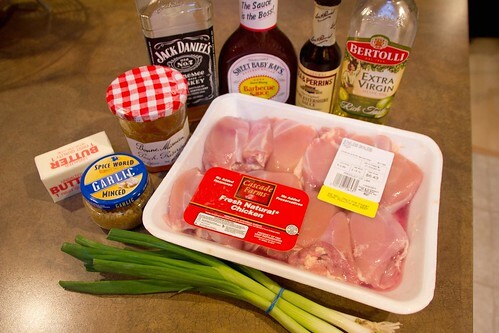 cook for a minute or two, allowing the whiskey to reduce. 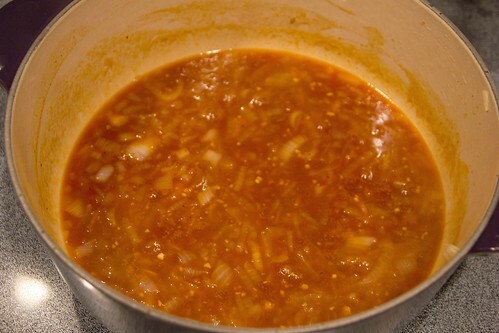 add the bbq sauce, peach preserves, water and worchestershire sauce. throw in garlic cloves. stir until combined. 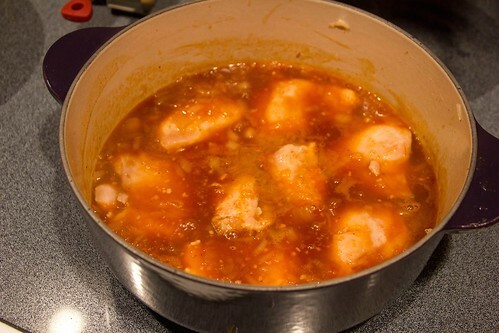 return chicken to the pot, skin side up. cover and put in oven. cook for 1 1/2 hours and then remove from the oven. 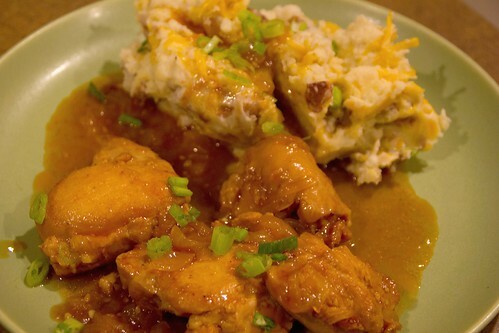 serve with smashed potatoes, make sure to put some extra sauce on the chicken and potatoes! garnish with green onion slices. any time! some would say i did it for me… i get to eat it!